During the 1890s, fire protection for the City of Escondido was provided by a group of volunteers using a hand-drawn cart and garden hose to extinguish fires. Whenever he saw smoke along the few short blocks of Grand Avenue, the Fire Marshal would ring a small hand bell to signal the volunteers. The hose cart, made up of two buggy wheels joined by a drum, was stationed at City Hall on Valley Boulevard, standing ready on a platform serviced by a six-foot ramp. Eventually, the small hand bell proved inadequate as a method for sounding the alarm and a bell committee was formed in 1892. A 30-inch, 300-pound bell was purchased at a cost of $54.47 and hung in the City Hall belfry. In 1905, a Volunteer Fire Company was formed and officers were elected. C. L. Charles was named Fire Marshal; Charles Shultz, Assistant Fire Marshal; and John Markle, Secretary. In 1914, Escondido purchased its first fire truck, a Federal Chemical Wagon, for $3,965. It was parked in the old Central Garage at the southwest corner of Ohio Avenue and Broadway. K.D. Franklin happened to be the driver because he worked at the garage where the truck was stored. Whenever there was a fire, he would roll the truck and pick up any able-bodied men along the way who wanted to fight the fire. It is believed that the truck was sold when the City purchased a second fire engine 12 years later. In 1924, the volunteers were organized into a Fire Department under the leadership of Karl Petersen. The volunteers paid 25 cents per month for the privilege of serving until 1930 when the City Council allocated $225 a month for the Fire Department budget. $175 was spent for equipment, Chief Petersen received $10, his two assistants received $3 each, and the 17 volunteers were paid $2 each. In 1926, the Fire Department purchased a brand new American La France fire engine, equipped with a 500-gallon water tank. Firefighters wore leather helmets and canvas turnout coats. The 300-pound alarm bell was replaced around this time by a whistle that signaled which section of the city was in danger by the number of short blasts. On November 21, 1939, groundbreaking ceremonies were held at 150 Valley Boulevard for Escondido's first permanent Fire Station. The firehouse was finished in 1940, complete with a brass slide pole. This adobe building also served as a meeting place for early City Council meetings and more than one meeting would be interrupted by a fire engine responding to an alarm. Two Mack Fire Trucks were purchased in 1949 and 1951, essentially retiring the old 1926 La France, which responded to its last fire at Ting's Pharmacy at the corner of Grand and Broadway in 1955. Ol' Betsy, as the La France came to be known, officially retired in 1958, as did Chief Petersen, who was succeeded by Ward Ensley. Ensley completely reorganized the department, expanding it to 18 full-time personnel and a Fire Prevention Bureau. In 1961, voters approved a $595,000 bond issue that allowed for building the fire station on Midway, a headquarters station on Quince, and purchasing two new Crown firetrucks. Ensley served as Chief for four years. In 1963, Louis Whyte was appointed Fire Chief. Under his direction, the Fire Department grew to four fire stations employing 67 fire suppression personnel. In 1967 a municipal fire alarm system was installed citywide, using alarm boxes located around the city, but the system was dismantled in 1979. Paramedics were added in late 1977. By 1980, Escondido had a Fire Station at each of the main compass points. Ol' Betsy had fallen into disrepair and, after being shuffled around the city, was finally left to deteriorate at the rear of the city yard. Fortunately, in 1980, the Escondido Historical Firefighters Association was formed to completely restore the La France, which they then placed on display in a small museum built by the firefighters just outside Station One on Quince, where it is housed today. In spite of efforts by the Escondido Historical Firefighters Association, however, the Old Fire Station One on Valley Boulevard was demolished in 1987. In July 1982, Bob Watts, a retired fire captain from San Diego who had been serving as Escondido's Fire Marshal, was appointed Chief. 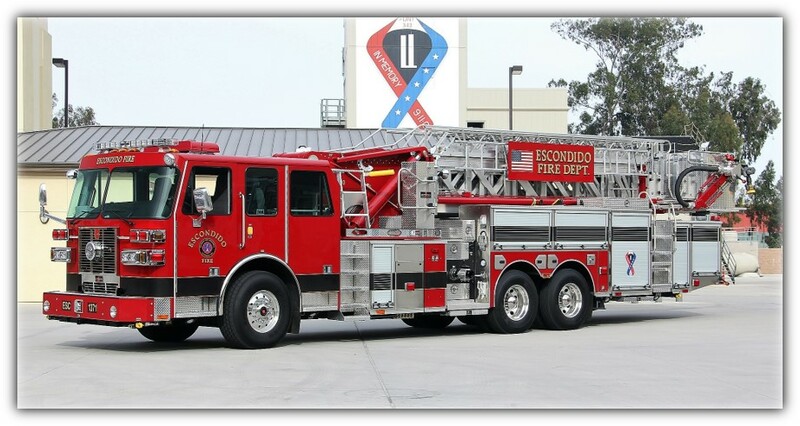 The Rincon del Diablo Fire District, which served much of the unincorporated area around Escondido, merged with the Escondido Fire Department in 1984, establishing Escondido's fifth fire station located on South Felicita Avenue. Chief Watts retired in July of 1992, succeeded by Miles Julihn, formerly with the Poway Fire Department and then Chief of the Larskpur Fire Department in Northern California. In a cost-saving measure, Fire Department administrative and prevention offices were moved to City Hall in 1994. Fire Station Number 2 on Midway was rebuilt in 1995. In 1996, Chief Julihn left Escondido and the Fire Chief position was filled first on an interim basis and then by formal appointment in 1997 by Vic Reed. Chief Reed had risen through the ranks from Paramedic Firefighter to Division Chief prior to his appointment as Fire Chief. In 2000, under Chief Reed's leadership, a Standards of Response Coverage Study was conducted, analyzing fire station locations and response times. This study identified the need for two additional fire stations and the relocation of Fire Station 3. In 2004, Proposition P was passed, providing the funding for these 3 stations, the rebuilding of Fire Station 1, and a new Police and F ire Headquarters facility. Fire Station 3, in its new location on Nutmeg, was completed in August 2008 and Fire Stations 6 and 7 opened in November 2008. The replacement for Station 1 downtown and the new Police and Fire Headquarters facility were completed in September of 2009. Upon Chief Reed’s retirement in 2008, Division Chief Mike Lowry was appointed Fire Chief. Chief Lowry started as a Firefighter Paramedic, rose through the ranks and held the positions of Training Chief, Operations Chief and Fire Marshal before promoting to Fire Chief. Chief Lowry lead the Department through the fiscal crisis that started in 2008 and resulted in a reduction of personnel. In 2012, the Escondido Fire Department instituted a new Non-Safety Paramedic program where single role paramedics became the entry level position to staff the Department’s ambulances. In 2016, Chief Lowry retired and Russ Knowles was appointed Fire Chief. Chief Knowles started his career as a Firefighter Paramedic and had risen through the ranks serving as a shift Battalion Chief and the Operations Division Chief prior to appointment as the Fire Chief. In 2016, the Escondido Fire Department purchased a Type 6 Brush Patrol that is housed at Fire Station 5. This vehicle was designed specifically for wildland fire response and its smaller frame allows crews to access remote areas. Chief Knowles retired in 2017 and Rick Vogt was appointed as the ninth Fire Chief for Escondido. Chief Vogt began his career with the California Department of Forestry and Fire Protection (CAL FIRE) Fire as a Firefighter, Engineer and Captain working throughout Riverside County. Chief Vogt also served the City of San Marcos Fire Department as a Battalion Chief prior to joining the Escondido Fire Department in 2015 as the Training and EMS Division Chief. Chief Vogt had most recently served as the Operations Deputy Chief prior to his appointment as the Fire Chief.